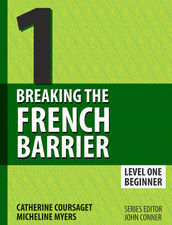 In this Level I book, ideal for beginning students, students are introduced to the present, passé composé, and imperfect tenses. They also learn commands as well as the future tense, and are introduced to sentence structure, object pronouns, and countless other “classics” of first-year study. Hundreds of exercises reinforce the amazing explanations offered by some of the country’s leading language teachers. The vocabulary presentation is stunning; pictures of each word accompany audio clips, and an amazing flashcard feature magically reinforces the learning. As a special feature, all even chapters feature a rip-roaring adventure series, reminiscent of old-fashioned radio, recorded by native speakers with sound effects and music. Comprehension questions follow each episode. Engaging cultural articles, supported by video, invite students into new worlds where stories are told of cooks, athletes, artists, musicians, dancers, poets — people who share their passion in a new language.